Prime Minister, the Most Hon. Dr. Hubert Minnis and Minister of Tourism, the Hon. Dionisio D'Aguilar and delegation toured Holland America's Nieuw Statendam cruise ship and resort facilities at Half Moon Cay, January 31, 2019. 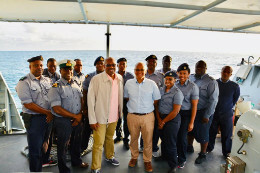 Photos show the Prime MInister and Minister D'Aguilar with officers of the HMBS Kamalamee, on ship tour, and viewing Half Moon Cay's touristic development.